Saturday March 24, 2007, 10:00 am, Ancient Future Trio with Matthew Montfort (scalloped fretboard guitar), Debopriyo Sarkar (tabla), and Mariah Parker (santur), West Coast Live, Freight and Salvage, 1111 Addision, Berkeley, CA 94702. Tix: $15 adv, $18 door. Broadcast on the Internet and syndicated to radio stations throughout California and the USA. Friday, March 30, 2007, 11:00 am to 1:00 pm, Ancient Future Duet featuring Matthew Montfort (scalloped fretboard guitar, Glissentar), Arshad Syed (tabla, santur), Music Introducing Mary Frances Personal Appearance, Macy's Main Store Union Square, 170 O'Farrell St., San Francisco, CA 94102. Adm: FREE. Saturday, March 31, 2007, 8:00 pm (doors open at 7:30), Guitar-Sitar Jugalbandi featuring Matthew Montfort (scalloped fretboard guitar, Glissentar), Pandit Habib Khan (sitar), Arshad Syed (tabla, santur), Larkspur Cafe Theatre, 500 Magnolia Ave., Larkspur, CA 94939. Adm: $22 adv. Tix: Larkspur Cafe Theatre Box Office, online at www.larkspurcafetheatre.com or charge by phone at 415-924-6107. Saturday, April 7, 2007, 12:00 noon to 2:00 pm, Ancient Future Duet featuring Matthew Montfort (scalloped fretboard guitar, Glissentar), Arshad Syed (tabla, santur), Music Introducing Mary Frances Personal Appearance, Macy's Main Store Union Square, 170 O'Farrell St., San Francisco, CA 94102. Adm: FREE. 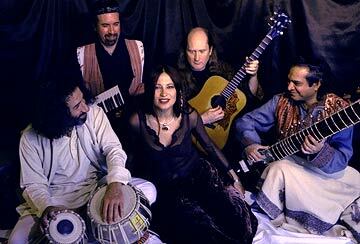 Saturday, May, 5, 2007, 7:30 pm, Ancient Future Trio featuring Matthew Montfort (scalloped fretboard and fretless guitars), Salaheddin Takesh (Arabic and Persian percussion), and Mariah Parker (santur and hammered dulcimer, keys), AHmbiance, 884 Lincoln Way (#30, upstairs), Auburn, CA 95603. Tix: $15 advance/$18 door. 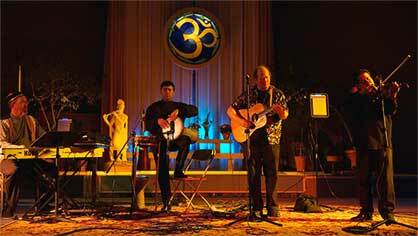 Info: 530 613-1865 and www.sacredmusicevents.com. Wednesday, May, 9, 2007, 11:30 am - 1:00 pm, Private Party, San Francisco. Thursday, May, 10, 2007, 5:30 pm - 8:30 pm, Private Party, San Francisco. Wednesday, June 13, 8:00 pm, Ancient Future "Going Away Party" for Salaheddin Takesh with Matthew Montfort (scalloped fretboard guitar), Salaheddin Takesh (Arabic percussion), and Mariah Parker (santur), Peña Pacha Mama, 1630 Powell near Union, San Francisco CA, 94133. Tix: $10 adult/$5 children. Info: 415-646-0018, or email: celebrate@penapachamama.com. Wednesday, June 20, 2007, 8:00 pm, Ancient Future Trio with Matthew Montfort (scalloped fretboard guitar), Debopriyo Sarkar (tabla), and Mariah Parker (santur), Peña Pacha Mama, 1630 Powell near Union, San Francisco CA, 94133. Tix: $10 adult/$5 children. Info: 415-646-0018, or email: celebrate@penapachamama.com. Wednesday, June 27, 2007, 8:00 pm, Ancient Future Trio with Matthew Montfort (scalloped fretboard guitar), Debopriyo Sarkar (tabla), and Patti Weiss (violin), Peña Pacha Mama, 1630 Powell near Union, San Francisco CA, 94133. Tix: $10 adult/$5 children. Info: 415-646-0018, or email: celebrate@penapachamama.com. POSTPONED (New Dates TBA): Wednesday, July 18, 2007, 2:00 to 4:00 pm, and Thursday, July 19, 2007, 10:30 am to 12:30 pm, Ancient Rhythms Performance Workshop featuring Matthew Montfort, ISIS FEST (a participatory costume theme event simulating Ancient Egypt), Isis Oasis, 20889 Geyserville Ave., Geyserville, CA 95441. $15 adm. Workshops, $30. Bring your percussion instruments or use the ISIS Oasis "Junkyard Gamelan." Info: www.isisfest.net. POSTPONED (New Dates TBA): Friday, July 20, 2007, 1:30 to 3:30 pm, and Saturday, July 21, 2007, 9:30 to 11:30 am, Modes and Melodies of the Ancient World Performance Workshop featuring Matthew Montfort (scalloped fretboard and fretless guitars), ISIS FEST (a participatory costume theme event simulating Ancient Egypt), Isis Oasis, 20889 Geyserville Ave., Geyserville, CA 95441. $15 adm. Workshops, $30. Open to melodic instruments and voice. Info: www.isisfest.net. featuring Matthew Montfort (scalloped fretboard guitar, Glissentar), Pandit Habib Khan (sitar), Arshad Syed (tabla, santur), Freight and Salvage, 1111 Addison Street, Berkeley CA 94702. Adm: $18.50 adv., $19.50 door. Half price youth tickets 16 years of age and under. Tickets available at the Freight Box Office, open daily from 12:00 noon - 7:00 pm, by mail order (send check and SASE to Freight at least 10 days before show date), at ticketweb.com, or charge by phone (866-468-3399). Saturday Oct. 13th, 2007, 9:15 pm, Green Music Network presents Vibrational Masters: A Cave Journey with Mark Deutsch (inventor of the Bazantar), Ancient Future leader Matthew Montfort (scalloped fretboard guitar, Glissentar fretless guitar), Jaron Lanier, Jomon Butoh Group and Goddess Chant Circle, Cave Journey at Hawk Hill Tunnel, Marin Headlands, Sausalito, CA 94965. Adm: $27.50 online only. Bring: Low low chair-festival style, ID in order to continue on up the hill after being welcomed by at the gate by the Cave Crew. Layers of clothing for proper temp. Don't bring: Glass containers, incense, dogs, children under 10 or musical instruments. A no smoking event. Friday, November 30, 2007, 8:00 pm, Ancient Future Arabic Dance Music Quartet featuring Matthew Montfort (scalloped fretboard guitar, Glissentar fretless guitar), Georges Lammam (Arabic violin), Faisal Zedan (Arabic percussion), Doug McKeehan (keyboards), Sapphira (world dance/violin),Music Recital Hall in Capistrano Hall, CSU Sacramento, Sacramento, CA. Adm: $15 general, $12 senior citizens, $8 students. Tickets at Sacramento State Ticket Office at (916) 278-4323 or at Tickets.com. May, 15, 2007, 10:am - 2:00 pm, Private Workshop for North Cow Creek School Student Field Trip, Blue Bear School of Music, Fort Mason Bld. D, San Francisco, CA 94123.